Start selling your music, photos, artwork, themes, e-books, PDF's, files, software or any other type of digital product within your Lightspeed store. Selling and managing your digital products is now easier and completely automated thanks to MyDigitalSales. You can create and manage your products from within your Lightspeed Backoffice. Is it a digital product? 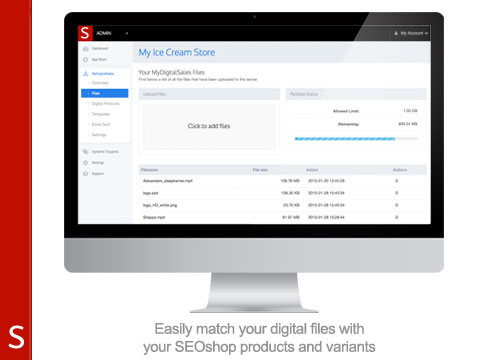 The Shappz Admin makes it easy to add your digital files to the product. Your digital product is now ready. As soon as a customer places an order for a digital product, MyDigitalSales will immediately process that information and will generate an email with a link to the customer's personal download page. 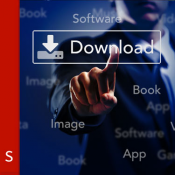 All the ordered digital products and their associated files are downloadable with one single click. Please note that: this App does not support the generation of e-Tickets. We are currently developing MyTicketSales, an App that supports the generation of tickets. (We are searching for beta testers. Interested? Contact our support department). 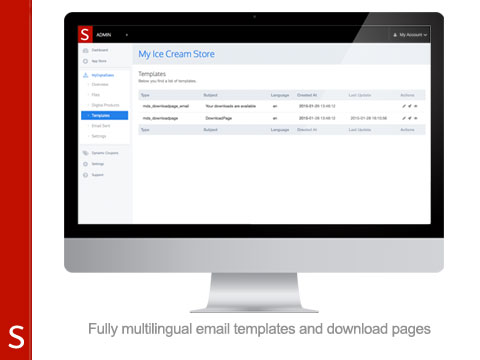 MyDigitalSales is offered from €9,95 per month. This includes 100 MB data storage and a fair-use bandwith policy. Do you need more storage? Not a problem at all, we offer very affordable plans. You can choose these plan from within the app. MyDigitalSales is fully optimized to start selling a wide variety of digital products. If it is software, images, artwork, recipes or videos, MyDigitalSales can handle it. Moreover, you can sell physical and digital products side-by-side. The App recognizes automatically if the customer has ordered a digital product. As soon as the customer placed the order and the payment was issued, he or she will receive an email with a link to a personal download page. Increased Customer Experience by automatically sending your customers the (DIY) manual of the product they have ordered. http://support.shappz.com/mydigitalsales/ => Currently under construction. Please contact our support department for any kind of help.